These little goodies are wonderful served at an afternoon tea. Children and adults love them alike so make some up for a party or for a snack for when your kids have their friends over. They also make great gifts during the holiday season. Try different types of fillings besides apricot. Cherry, strawberry, raspberry, peach and lemon are nice choices. Always use seedless jam or preserves. 1. Preheat the oven to 350 degrees F/180 degrees C.
2. In a large bowl, cream the butter and sugar and stir in the vanilla extract. 3. In a medium-sized bowl, mix the flour and salt. Combine the flour mixture and the butter mixture until the dough is crumbly but holds together when pinched. 4. Take a walnut-sized piece of dough in one hand. With the thumb of the other hand, gently knead it three times. Roll it into a ball and place on an ungreased cookie sheet. 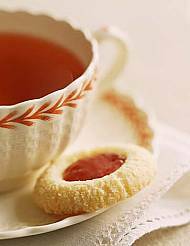 With your knuckle or thumb, press a well in the center and fill with 1/2 teaspoon of jam. 5. Bake in preheated oven for 10 to 15 minutes. Cool on baking sheet for 5 minutes and remove from sheet onto cooling rack. The best cookies! I cooked it for New Year, and my mom loved it the most. She asked me to bake more! These cookies are delicious! The consistency came out different than I expected; but they were still good. I don't care too much for apricot, so I used other jams (guava, rasberry, pineapple, etc.) instead; and they were fantastic!! People were calling me the next day asking for more. Now I make them several times a week!! These are great. My friend had cancer. She gave us the recipe; so now when we make them we think of her. GREAT cookie!!! Only change I made was instead of using vanilla extract, I used 1 1/2 tsp. of vanilla paste and also made half the cookies with raspberry jam. Wonderful Thumbprint cookie!!! My mom used to make these every year at Christmas but rolled them in powdered sugar after they came out of the oven. They're still my favorite!